The Casitas at Villa Casa Terramar in Sayulita. Close to everything and yet a world away, nestled at the end of a cobblestone street, just 4 blocks from the beach and charming village of Sayulita. Your own tropical paradise. The property features a large beautiful sapphire pool, 2 sundecks one upper and one lower; providing plenty of lounging and chilling space and a gas grill all surrounded by lush tropical landscaping. Many guests spend a least one day during their visit just enjoying the pool and tranquility of the Villa. Each Casita is unique and offers a perfect home away from home for your Sayulita vacation. Casita de Alberca, located just off the pool area, is a charming unit that sleeps 3. French doors open onto a large patio where you can enjoy your morning coffee or an afternoon cerveza surrounded by a lush tropical plants. The unit features a fully equipped kitchen decorated with hand made mexican tiles, queen bed 4 poster bed, en suite bathroom, daybed and desk. Casita Tortuga is a new stand alone casita located just a few steps down from the pool and sleeps 2. It is a 1 bedroom with queen bed, and 1 bath with a fully equipped outdoor kitchen, private patio and lots of natural light. The bedroom has accordion doors that open completely to the patio and kitchen. Enjoy your morning coffee on the patio listening to the parrots chatter and in the evening experience a hammock style sunset from the pool terrace overlooking Monkey Mountain and the village of Sayulita. Casita Elena is a unique unit tucked on the side of the property, very private. It is a 1 bedroom 1 bath unit with queen bed and twin and can sleep 3. The best part of this casita is the open kitchen and living area housed under a palapa roof surrounded by lush tropical foliage. You are completely in your own little tropical world when you stay here. Have a large group? You can rent all three Casitas. Casita de Alberca, Casita Tortuga and Casita Elena providing a 3 bedroom; 3 bath accommodation that sleeps 8. For rate information, please view the Pricing tab or use the contact form to email us. -All of our kitchens come fully equipped with everything you need; including coffee makers, microwaves, toasters, utensils, dishes etc. -We supply purified drinking and cooking water. Bacteriacida is also included for washing fresh fruit and vegetables. -Housekeeping service is provided once per week. Your unit will be cleaned and supplied with fresh towels and linens. -Free secure wireless internet service is available throughout the property. Even works poolside. -All units have digital safes for your valuables. -Beach towels are provided. Umbrellas, beach chairs, boogie boards and coolers are available for you to use as well. We are centrally located and close to both the beach and the village (about 4 blocks). We are at the end of a dead end street off of Calle Coral and the main boulevard into town. 4 blocks to the west is the beach and the northern surf break. The area is a mix of Mexican and vacation homes which gives an authentic feeling to the neighborhood. **Children are welcome at Villa Casa Terramar, however please be aware that like many Villas in Sayulita there are steep drop offs, open balconies, open pool area and therefore toddlers and small children would require special attention. Please use the contact form to get in touch with any questions and to book your stay. Sayulita is my home and I enjoy sharing it with my guests. I hope you choose to spend your vacation with us. Incredibly comfortable, more than expected, stay here! Beth's villa is so incredibly comfortable. It was more than we ever expected. Safe, had everything we needed, plus lots of extras we didn't think about but totally enjoyed (like an umbrella and chairs for the beach). And, Beth was an exceptional host! Attentive and responsive, and thoughtful about what we might need or enjoy. If you are headed to Sayulita, definitely stay here! Terramar was the perfect place for our get away from the cold. We stayed in Casa Tortuga for 2 weeks & very much enjoyed cooking & then dining on our veranda, perfect also for those morning coffee's & games in the evening! The pool area was where we hung out after a busy day of surfing, hiking & partaking in downtown Sayulita activities. We were a 10 minute walk from 2 fabulous yoga studios. The walk to the casa from town was great excercise (uphill) & the sounds of the local wildlife reminded us we were defintely living in the jungle. We shall return soon to this little piece of paradise! Thank you! It was truly my pleasure to have you stay with us. I hope you can come back and visit us again soon! 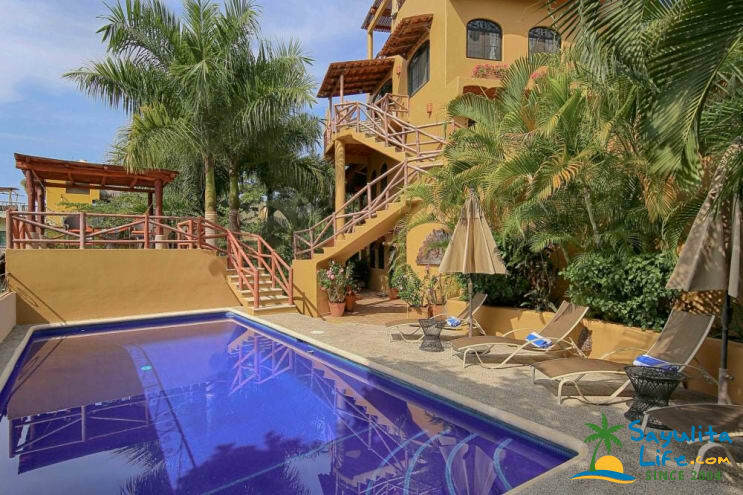 VillaCasa Terramar is an intimate place which is impeccabley maintained by the owner and has a feel of home which is in keeping with Sayulita itself. The casitas have well equipped kitchens for those who are inclined to cook in and hang out . Both inside and outside spaces are inviting and very user friendly.would definitely go back. Thank you so much. It was a wonderful having you stay with us. I hope you can come back again one day soon. Beth is a phenomenal hostess and the space is wonderful. Everything is very clean and the house is well furnished with everything you would need. We had stayed in Sayulita before in another property with a palapa, and it was so much noisier. The Casita Elena bedroom blocks out a great deal of the noise from chickens, dogs, and music, which is charming but not always easy to sleep to! So it is the best of both worlds, with open living space and closed sleeping space. The hike up the hill is not for the faint of heart, so consider renting a golf cart to get around in! We had a wonderful time and can’t wait to go back. Muchas Gracias Beth! Our casita was clean and as expected. It was a nice blend of open air with the bedroom enclosed to offer privacy and protection from bugs at night. There was some road construction during our stay which made getting to and from the unit interesting and would have been difficult for someone with limited mobility. It is a hike up but manageable. The pool area was private and peaceful. We enjoyed our time and would stay again. Great amenities, loved the pool. Great amenities! Has everything you need in the kitchen. Killer pool and lounge area above. The house is located on a semi steep hill so walking back to the house is a good way to burn some calories. This place is absolutely lovely. Beth was kind, generous and took wonderful care of us and went above and beyond. We loved her dog who was a friendly and adorable visitor from time to time. The casitas are gorgeous and the pool is refreshing and tranquil. The house is set up on a very steep hill over the town. Our legs and butts were stronger after 6 days hiking back and forth from the house to town-which we greatly appreciated. As a note, the location would be difficult for anyone (without a golf cart, which are all over Sayulita) who had any limits to their mobility. We liked having the exertion after a whole lot of drinking margaritas and eating tacos but it might not be for everyone. The only other heads up for potential travelers is that the house is in the jungle and as such, is surrounded by all kinds of critters that make noise including tons of awesome birds, so many roosters, and most significantly, dogs. There was a lot of barking, sometimes continuously for hours, during the day and the night. Our friends stayed a few blocks away and didn't have the same issue but we did and slept with ear plugs. It started to get hard by the last day. Overall great place. The town is sweet and the beaches are fantastic. Mexico is such a wonderful country. Beth is lovely and so is her Casita. She greeted us warmly and gave us great information that helped us plan our stay. Our space was clean, cozy and had charming details that made us feel at home away from home. Be prepared for some walking and mild hills to get to the Casita, but they help to burn off the daily indulgences the town has to offer. The roosters and dogs mentioned in the listing and other reviews are for real, so be prepared for the neighborhood sounds if you are not a naturally deep sleeper! Everyone we met was friendly and we felt welcome in all the local places. Beth's place was a great deal and we are glad we stayed. Great experience, loved the location and amenities. Would stay again. My girlfriend and I only had a short stay of 3 days and nights so we were looking for something easy that would make the most of our experience. Casita Tortuga was the perfect little getaway. It felt like living in a treehouse, with an open air experience that overlooked the scenery beyond, and it really was perfect. Upon arrival, there were two beers waiting for us in the fridge, and a very detailed list of things to do around town. The space was clean and spotless, which after a long experience of traveling, is comforting to know that the space is well taken care of. The Casita is very well located, not too close to the hustle and bustle, only a 10 minute walk to the main city center. We were able to get most places by foot without any additional mode of transportation. What really made the experience was Beth's quick responses through imessage and email. We needed additional beach towels, as ours got devoured by the ocean, and didn't dry in time. Barely an hour later and we had additional towels. The experience was amazing and we will be definitely coming back someday! Incredible stay, can't wait to return! Beth was incredibly friendly and helpful. Our casita was perfect and absolutely loved the outdoor kitchen. She was extremely helpful and could not be in a more perfect beautiful location. We will definitely be back! We require a 50% deposit at the time of booking, with the balance due 30 days prior to your arrival date. We use Paypal for all deposits, which allow you to pay with any credit card. Please note there is a 4% charge that is added to your rent. Casita de Alberca (sleeps 3) studio unit, queen bed, bathroom, daybed, fully equipped kitchen, desk, safe and patio. Access to pool, sundeck and gas grill barbecue area. Low Season (July - Oct): $450 usd per week or $75 nightly based on 3 night minimum stay. High Season (Nov - June, exluding Holidays): $700 usd per week or $125 nightly based on 3 night minimum stay. Holidays (Thanksgiving, Christmas, New Year, Easter): $900 usd per week one week minimum stay. Casita Tortuga (sleeps 2) 1 bedroom 1 bath, fully equipped kitchen, safe, desk and patio. Access to pool, sundeck and gas grill barbecue area. HIgh Season (Nov - June, excluding Holidays): $700 usd per week or $125 nightly based on 3 night minimum stay. Casita Elena (sleeps 3) 1 bedroom 1 bath unit, with queen bed and twin bed. Fully equipped kitchen, dining and living area. Access to pool, sundeck and gas grill barbecue area. Low Season (July - Oct): $600 usd per week or $100 nightly based on 3 night minimum stay. High Season (Nov - June, excluding Holidays): $850 usd per week or $150 usd nightly based on 3 night minimum stay. Holidays (Thanksgiving, Christmas, New Year, Easter): $1000 usd per week one week minimum stay, usually Sat - Sat. Casita Elena is also available on a monthly basis. Please contact me for additional information. For large groups, all three casitas can be rented and provides 3 bedrooms, 3 baths for up to 8 guests. High Season: (Nov-June) $3600 usd per week. Rates subject to change without notice prior to booking. Our units rent by the week, typically from Saturday to Saturday. We are happy to accommodate alternative arrival dates based on availability. Originally from the Chicago area but now I call Sayulita my home. I have the best job in the world, being the host for my guests at Villa Casa Terramar and sharing this magical town.Come and visit.....cold cervezas will be waiting.